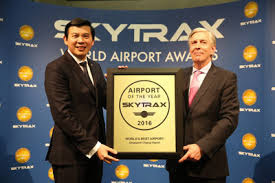 Skytrax World Airport Awards which lists the Best 100 Airports of the World was released by the UK-based Skytrax, a consultancy firm which runs an air airline and airport review and ranking site. The accolade was awarded at the Passenger Terminal Expo 2019 in London. Singapore's Changi Airport has been crowned the world's best aviation hub for the seventh time in a row. Singapore's Changi Airport is well known for its rooftop swimming pool, two 24-hour movie theatres and shopping spots. Tokyo International Airport (Haneda), up one place from 2018 stood at the second place. The airport hub also won accolade as World's Best Domestic Airport and World's Cleanest Airport. South Korea's Incheon International Airport, down one place from its second-place spot in 2018 is the other entrant at number three. Incheon International Airport also won the accolade for World's Best Transit Airport. Indira Gandhi International Airport of New Delhi was eight points up this year after featuring at the 66th spot in 2018 and stood at rank 59. Mumbai's Chhatrapati Shivaji Maharaj International Airport stood at 64, down one rank from the previous year. Rajiv Gandhi Hyderabad International Airport stood at 66, up 10 ranks. Bengaluru's Kempegowda International Airport at 69, down five ranks. Q.Which airport has been crowned the world's best aviation hub for the seventh time in a row by Skytrax?